The PFBC is looking for some help gathering data on how successful the Lehigh River fingerling plantings is going. 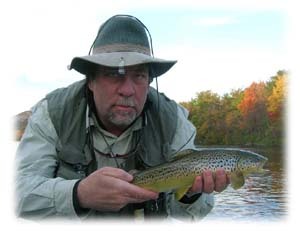 If you fish the Lehigh be sure to keep an eye out for the fin clipped fish. Identification is easy - - either the adipose fin will be clipped or the pelvic fin will be clipped. And when you catch one, record it in the log book supplied by the PFBC. This is definitely a way for the angler to help aid the PFBC in their ongoing study, as well as to help improve the Lehigh's trout fishery. Sorry for the hiatus, but we are back, and better than ever. A new machine is up and running, and so are our reports. Before this bout of coldness, we were hitting the Lehigh, and it was fishing well. So there should be no reason that once we get to the other side of this cold, and into some Indian Summer weather, the river will pick back up again. Our best success has come on smaller mayfly imitations, along with caddis patterns. The bugs coming off have mainly been olives, but we are still seeing some Isos, and caddis. Mid-day some well placed nymphs are moving fish as well. And of course large streamers are getting some look-sees. October 1, 2009 - - There She Blows! Better get your Lehigh fishing in prior to the weekend. Cause after that, we are looking at an extended period of white water, followed by the BIG DUMP. For the first time since the inception of these Recreational Release Plans, a mega-release of water is going to occur. The event takes place Monday, but over the weekend is a whitewater event, then after Monday you can bet there will be ramping into Tuesday and maybe even Wednesday. So we are looking at billions of gallons of racing down thru the Lehigh in the largerst ever planned whitewater release. All of the above begs the question...'How does this sort of release benefit the resource?' Clearly it does not. Put it this way, if you released the same quantity of water that will be released during this event, and spread it out more evenly over the last two months, the river would have seen an additional 50-75 cfs. And when you are dealing with what has been a 300cfs release during non-whitewater releases, that is a nice piece of water. Suffice it to say, this water could be put to use more effectively. As for the fishing -- it is still very good. On days with bugs, you will find the fish up and eating. On overcast days hit it during the heat of the day. Otherwise, late afternoons have been best.